Bristol Airport has invested £400,000 in state-of-the-art aircraft recovery equipment designed to ease disruption should a plane need to be removed from the runway or other operating area. The equipment, which is used in airports across the world, will dramatically cut the time it takes to move the aircraft and so limit any knock-on effect for passengers and airlines. Passengers at Bristol Airport suffered around seven hours of disruption three days before Christmas last year when a BMI plane arriving from Frankfurt with 25 passengers on board skidded off the runway while taxiing. Dozens of flights were delayed or cancelled while airport workers secured the site and towed away the 15-tonne, twin-engine Embraer 145 aircraft. The new aircraft recovery system has been supplied by Farnborough, Hampshire, based AMS Aircraft Recovery, which has been designing and supplying equipment – and training ground crews to use it – since 1988. Similar systems are used by airports and airlines across the globe, with London Heathrow and British Airways among its UK customers. 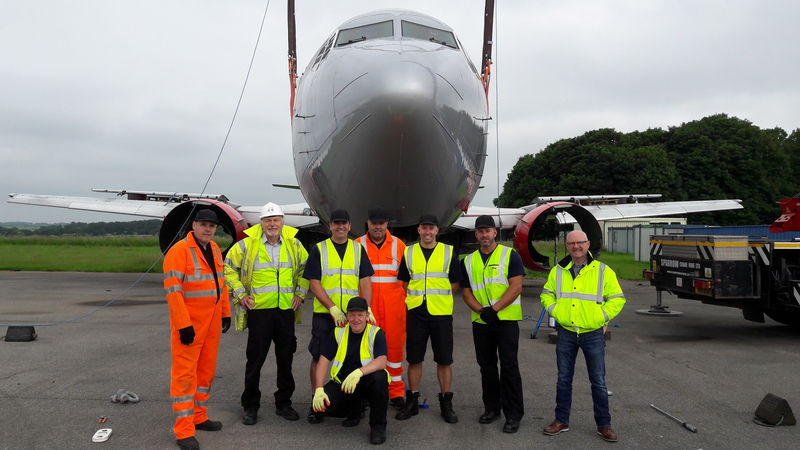 AMS has trained Bristol Airport’s Fire and Rescue Service and its Motor Transport Service crews to use the equipment. AMS managing director Mark Knight said only Heathrow and its British Airways hub had a larger range of AMS equipment than Bristol. Other UK airports with the system include Manchester International, Birmingham International and Belfast International. The equipment includes a system of airbags which can be inflated to raise the aircraft for nose and main landing gear failures; portable roadway that provides a track for aircraft to be towed safely back onto a runway - part of a system of ‘de-bogging’ equipment – a fuselage lifting sling system that lifts an aircraft so it can be lowered onto a turntable for recovery using the AMS 40t transporter systems; and a ‘sledge’ system if a plane’s landing gear completely collapses and it comes to rest on its belly. AMS was the first provider to lift Concorde using airbags, to move a disabled aircraft using a sledge system and to develop a turntable for the Airbus A380 superjumbo in conjunction with British Airways.